Charlottesville media room design is the perfect option for homeowners who want all the premium sound, video, and automation quality of a home theater, but don’t want to dedicate an entire room for the purpose. Although there are a lot of places you could shop for high-definition screens and upgraded speakers, Appalachian Home Technologies takes Richmond VA media rooms to a whole new level. By mixing together home automation for lighting shades, stunning audio and video, and even recessing projectors, we can integrate premium home theater components into existing aesthetics. In other words, we can use Washington DC media room design to give you the viewing experience you want, and then help you make it disappear when you don’t need it. That’s important, because the key to Fredericksburg media rooms isn’t in configuring televisions and remotes it’s in making sure that the media room is just as stylish and functional when it’s not being used as a home theater. For us, that means ensuring that our clients get the very best while keeping things like wires and controllers out of view. 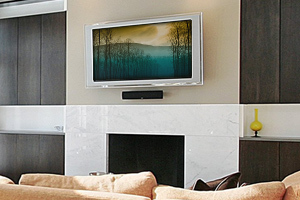 Our motto for Richmond VA media room design is “all of the quality, none of the compromise.” If you want a team that’s willing to go the extra mile to maximize your budget and incorporate audio, video, and home automation into your existing space, then you want to work with AHT. Contact a member of our team today to learn more about Charlottesville media rooms and see what we can do to turn your dream of a smarter home into reality.